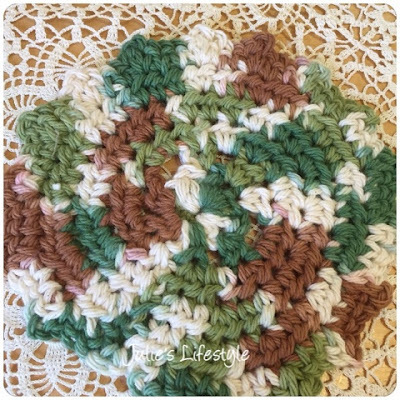 Hi friends, I love crocheting coasters and I found a really nice pattern to make at Oliva's blog called, Oliva's Creative Quest. 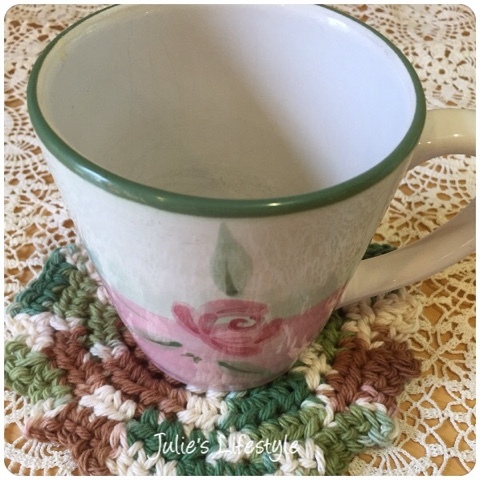 If you would like to make your own coasters, you can find the pattern HERE. Shown below is the version of the coaster I made using fall colored yarn. Crochet Hook: US size H.
Yarn: Bernat, Handicrafter Cotton, Harvest Home Collection in the color Harvest. Please take a minute to visit Oliva's awesome blog HERE. Thanks Oliva for sharing this really cute pattern to make coasters. I'm having fun crocheting them with your pattern. I hope I have inspired you to make some coasters too. I'm looking forward to making these for gifts for the holidays. I also made some to donate to our annual crochet sale we have at my church. Oh Julie!!!! You have made my day!!! Perfect color for this time of year!!! You have created a beautiful coaster, my friend :) I love the sweet autumn colors. Enjoy your Thursday! Hugs! Beautiful! The colors are just perfect! One of my competent crocheting friends made me some red white and blue coasters this summer. I just put them away until next summer. Yours are perfect for fall. What a perfect coaster for Fall, Julie. I love crocheting quick and easy projects. I'll bet this would also make a nice dishcloth by just increasing it. I love crocheting too...thanks for sharing the link to the pattern. I love the way your coaster came out and I love how it matches your pretty little cup perfectly...Was that done on purpose? Great job. Love the coasters and the colors. Crocheting is such a lost art so happy you enjoy it and can make such pretty things. The colors are so pretty! What a cute coaster!! Thanks so much for sharing and linking up to our party! Enjoy your weekend! Its very pretty and looks great with that mug. I love crochet coasters! This is a lovely pattern and the colors you chose are perfect for fall! Thank you for sharing the link! I love the color you chose. Thanks for sharing the link to the pattern! Dearest Julie, that you for sharing your beautiful creativity with Roses of Inspiration. It's always a sweet blessing to have you at the party. Hugs to you! I don't crochet, but my sister is a whiz! I'm going to share this pattern with her. What a fun little coaster, how clever it matches the cup!!! I love it!! These look wonderful, I will have to make some thanks for sharing the link! My dear friend, this is just gorgeous and the perfect colour yarn for Fall. Thank you so much for linking up to Thriving on Thursdays. I really appreciate it. I'm featuring this one at tomorrow's party. Cute idea Julie. Love the yarn color! Thanks for sharing with SYC. These colours are just great! Well done! So cute!! Thanks for joining Home Sweet Home! I love to crochet also. Thank you for sharing at the Thursday Favorite Things blog hop. I love anything that's crocheted. Thanks for sharing at Merry Monday.